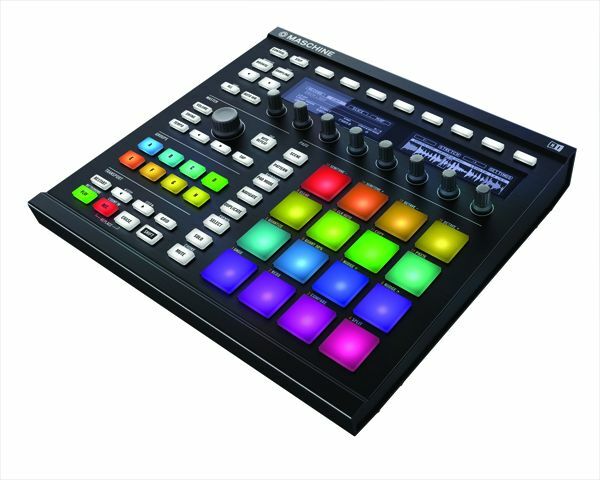 Taking the information from Native Instruments forum I present to you the New Maschine – rumoured to be launched September……(Edited: Release date is October 1st – New video can be seen here) As no official press release as been seen yet from NI it maybe that the source has leaked this ahead of time. I am unable to confirm the truth of its existence but the information you see below seems pretty legit to me. I take no responsibility for the inaccuracy of the information listed below. At first glance however, it appears to have been made with the Traktor Remix decks in mind. Here it is, next-generation design, multi-colored pads, timestretching capabilities, and more. This next generation of MASCHINE has numerous enhanced workflow improvements for an even more intuitive and faster performance. Now with heightened sensitivity, each one of the 16 touch-pads can be assigned a different color to easily separate and identify sounds, patterns, groups, and scenes. With the New MASCHINE you can timestretch and pitch shift your samples directly from the hardware, eliminating the need to jump back and forth from host systems. The hardware design has changed a bit; one notable addition is the new master push encoder with grid, and the 47 all-new click-buttons that help to speed up the workflow. The displays have been updated also; the new high contrast displays have a higher viewing angle that will help keep things visible, even with some difficult live performance placements. More hardware and less software,the New MASCHINE allows for Host Transport Control, meaning that the hardware’s transport controls can be used to control the host DAW when the unit is being used as a VST, Audio Unit or RTAS plug-in. There are also some new effects such as Transient Master, Tape and Tube Saturators that will further help to sculpt performances, and a full version of the MASSIVE synthesizer is included with 1,300 earth-shattering sounds to play with. Additional design features include a fully customizable look; magnetic faceplates and removable knobs let you incorporate your own style with optional MASCHINE CUSTOM KITS that can be purchased separately. The New MASCHINE integrates easily into your computer-based studio setup. Use the hardware controller to find, load, and play sounds, automate parameters, and arrange patterns on the fly. Combine this with the ability to control and sequence all of your external hardware instruments, or switch to MIDI mode to control other software. After quickly and intuitively developing your ideas, drag and drop your patterns as MIDI or audio files directly into your DAW to finalize and mix your production. You’ll soon realize The New MASCHINE is a powerhouse capable of revolutionizing the way you make music. The New MASCHINE is fast becoming the ultimate performance tool for creative musicians. The New MASCHINE controller is super-sturdy, yet easily portable. The highly responsive pads now have heightend sensitivity and can easily be assigned different colors to keep your kits organize. The new Master Push Encoder and endless rotary knobs are addictively playable, while the two improved high-resolution backlit displays keep you informed of what’s going on – perfect for any club or stage. Use the New MASCHINE as an instrument for performing your own tracks, or sync it with other gear like TRAKTOR PRO 2 (sold separately) to add more dynamics to your live set. The New MASCHINE comes with over 6GB of ready-to-use, professional and inspiring sounds. Create rhythms and melodies right away with the included drum kits, one-shot samples, basses, synths, and acoustic instruments – all fully tagged for easy browsing. It also includes KOMPLETE ELEMENTS, providing more than 1,000 stunning sounds drawn from the flagship KOMPLETE 7, and a full version of the MASSIVE synthesizer with 1,300 earth-shattering sounds used widely in all styles of music today. And now, you can add extra fuel to your New MASCHINE with the new range of MASCHINE EXPANSIONS – premium sample kits created by renowned sound designers and artists.